Both the North and South layouts at this resort are the design of Robert Putman, a Californian professional who was asked by developer Gregory Peters to build two contrasting courses on the 1,400-acre property during 1971-2. The West course followed in 1996 when Dave Thomas extended the former 9-hole La Princesa (first opened in 1986), meaning the resort can now tempt golfers with a choice of three tremendous courses. Upgraded by Arnold Palmer in 1993 then refurbished in-house during 2004, the South course has changed considerably since the early days when it held the Spanish Open between 1973 and 1977, thanks mainly to renewed investment by different owners over the years. The course feels fairly spacious (despite the many palm trees that line the fairways) but aquaphobic golfers might think twice about striding the fairways on the South course as only a handful of holes are without some form of water hazard to tease and torment! A couple of years ago the South course was really run down, but La Manga Club resort has put in a bit of restorative work in recent years, and it is now comparing favourably with its colleagues the West and the North. The South is the Championship layout and that is evident by its length and the bunkering. When the wind gets up it can be a real test, and whilst in the past it was a little flat and un-inspiring, the holes have been re-designed in some areas to be a little more pleasing to the eye. This is the course you will see most often on TV featuring all those Celebrity Charity events. The opening holes are a not spectacular but the 4th, which used to be a real testy par four, has been extended to a par five with the addition of an attractive pond in front of the green, which gives the course a little of the charm it lacked in its previous incarnation. The 6th, which was once the 9th hole, (I think they saved some labour by just turning the flag number upside down), is a terrific par five with a lot of wet and sandy hazards as you near the green, but that is only after a tough blind tee shot onto a wide and downhill fairway. The 10th is a little ordinary but the 11th has benefited from the extension of the greenside lake, making a second shot a real tester. The 12th, a short par three, is the hole that witnessed the oldest man ever to achieve a hole in one. Beyond that, the 14th, a par four, presents one of the largest sand traps in Spain, running almost the whole length of the right hand side fairway. The 17th is a testing par three, almost all of the par threes on the South course need a good biff, but the 18th is the signature hole, with its tough tee shot (water and bunkers everywhere) and then a really well-protected green. So many bunkers surround it you’ll think the tide has gone out. Despite its championship status, the South is the least charming of the three courses. However, it does give the most honest test of golf. It’s long, there’s plenty of bunkering and the course demands some solid hitting. You can let the driver out of the bag far more than you can on either of the other two tracks, but somehow it does lack character and it is certainly nowhere near as pleasing on the eye. Great challenging course with different tees where all kind of players can enjoy. Up to even host professional events. The South course is by far, in my opinion, the best course in the La Manga complex in every single aspect. I played this course in March of 2016, and was rather underwhelmed by the experience after hearing some good things. Although the facility at La Manga is vast with good facilities, I found the course rather bland and lacking in character. On the plus side the condition of the course was good. The South course is of course their Championship routing, the longest course at La Manga and perhaps the course you might expect the most at this type of resort. It’s fairly open and generous off the tee but still requires solid shots. Since it’s so open wind has a huge impact on the game. The greens run fast and the course plays fairly firm and fast as well. Bermuda grasses add very much to the challenge if the fairways are missed. It’s a fun and relaxed golf course. The South course at La Manga can be described as the strongest of the three courses here, although this does not mean that it will all golfers favourite. My opinion is that whilst it is probably the toughest test it will probably be the better golfers that have the South at the top of their list of the three. The opening three holes are pretty straight forward but the 4th is the first worthy of a mention – a par-5 just over 500 yards with three bunkers around landing point for the tee shot, add in water to the right that meanders all the way to a pond in front of the green – a very strong hole. The front nine continues to deliver but if I am honest, it is a little predictable and the fun and interest levels that I get on the West and the North courses is not really there. The back nine starts well; the 10th is a short par-4 dog-legging left with smart bunkering short of the green. Then the 11th is a big hole; under 400 yards with plenty of water on the right-side from about 100 yards out all the way to the double tiered green. I like the 14th hole a lot (375 yards), where the tee shot is the key; long (starting from 180 yards from the tee) waste-land on the right all the way to the green must be avoided. The more that I think about it, the last five holes are probably the most enjoyable; the 15th requires a drive to a tight landing area and then approaching over the barranca (dry ditch) to a cleverly bunkered green-site. For those with long memories, the Spanish Open was held on the South course back in the 1970’s (when Gary Player was the first Golf Director at the resort) and it is the 18th hole that is the most memorable from those days; a par-5 around 500 yards with water left and right and then 50 yards short of the green too – a great finishing hole. The La Manga resort has now been around for more than 40 years and is an obvious success story but they do have to be a little careful though as now there are some places around the courses that need a bit of a re-fresh (paths, signage, bare patches etc. ), which I believe is in hand and will only go to strengthening the experienced further. When the wind blows (which is a lot of the time) this is a brute, especially the back 9 where there are a number of shots with no bale out. It's a tough course and one that leaves you drained at the end. You have to be long and straight to score well here because the greens are huge and being 'on the green' never means that you are down in two more unless you putt really well. 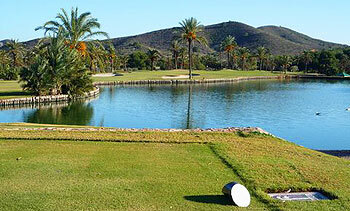 After the West course, I would rate this as the second best course at La Manga. It is also a course where you can get the driver out a lot as the fairways are quite wide. There are plenty of interesting and challenging holes here, such as the par four 11th, which has a lake on the right side which needs to be avioided, and 12, a nice little par three over water, which proved to be nasty playing in a 20mph wind! The 18th also deserves a mention, a long par five with loads of water and sand which must have ruined a lot of rounds! The South is my least favourite of the three courses at La Manga but it’s by no means a bad track. What it lacks is elevation change and consequently palm-lined fairways, water hazards and bunkers provide the definition. The best hole for me is left until last which is not only the signature hole but the best on the course by a long way. Look out for the plaque on the 18th tee that commemorates Arnold Palmer’s eagle in the final round of the 1975 Spanish Open which secured victory. The South course twists and turns through the palms and lakes that seem to have a familiar look, even on your first visit. Some great holes especially on the back nine, the 11th is a great par-4 with a huge lake to the right and in front of the green. Lovely finishing hole, par-5 with a ravine in front of the green. The South can be called holiday golf but at the top end of this category.